Consumption generally slows as people age, but health shocks play an important role in slowing down decline. 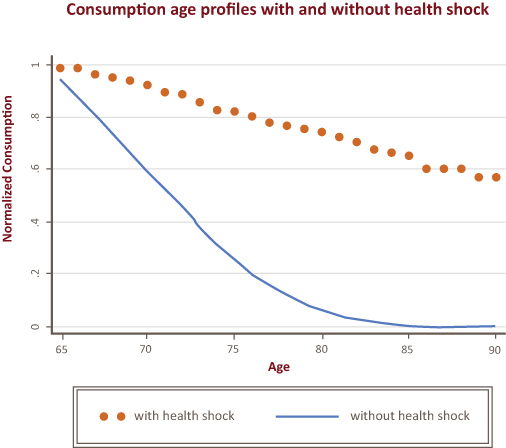 Including health investments in the model could help explain the wide differences in consumption-age profiles related to health. Health investments, such as physical exercise, have a significant effect on the evolutions of both health and consumption in retirement. The authors state: “The findings in this paper suggest that public programs like Medicare and Medicaid play an important role in shaping the consumption and health behavior of the retirees, as well as the retirement and saving decisions of working people.” Quantifying the magnitude of these effects might inform the optimal design of such programs.